The December 2012 Scanfest will take place here at AnceStories this coming Sunday, December 30th, from 11 AM to 2 PM, Pacific Standard Time. We will be using Blyve, a live blogging platform that you access right here at AnceStories. On Sunday at 11 AM, PST, come right here to AnceStories and you'll see the Blyve live blog/forum in the top post. 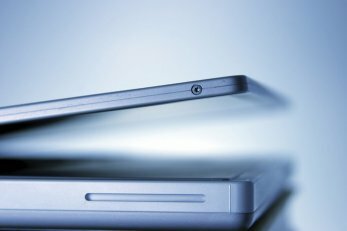 It's not really a "chat room," per se, it's more like a live forum and anyone visiting this site can read and see what is happening in the forum. Postcard to Rena Lerfald (c/o J. A. Weich) in Dickinson, North Dakota from John Lerfald in Woodinville, Wisconsin, postmarked 18 Dec 1912. Westaby-Lerfald Postcard Collection. Privately held by Troy Midkiff, [ADDRESS FOR PRIVATE USE,] Vancouver, Washington. 2012. This year, I'll be making new memories of Christmas with my schatje ("treasure"). Although we had started dating by Christmas last year, we had only had two dates and we spent Christmas with our respective families. This year, he will be celebrating with my extended family and me at my home. I look forward to many more shared Christmases in the future! I can still see myself in the kitchen with the phone to my ear, my body bent over as if someone had sucker-punched me. I could hear my voice, sounding as if it were very far away, crying out and asking, "How? Why?" Only earlier that week, Chris had come to visit me at my workplace, located just a few blocks away from his campus. We were the same age--he was three months younger--but had been in different grades because I had started school a year early. He had met my co-workers and we had gone out to lunch. We'd discussed our busy lives as college students. A bright student, he'd gotten a scholarship to GU and was studying engineering. He was excited to be going on a retreat that coming weekend. As a family historian, have you ever noticed any of your ancestors who were born, married, or died on Christmas? I have quite a number of family members who have Christmas day events, in both my children's paternal lines and my own lines, but I picked out only direct ancestors to share with you. Normally, we spend Christmas either at our home or my sister's home here in the Spokane area, or else up north of Colville at my parents' home. It's difficult to get to my parents' place in the winter, as they live off an old logging road up in the mountains, miles from town, and usually have many inches of snow. You usually need a four-wheel-drive or a front-wheel-drive with chains to get in and out, and it's quite the production, making the trip up there! This is an all-time favorite photo of my children, Christmas or no. 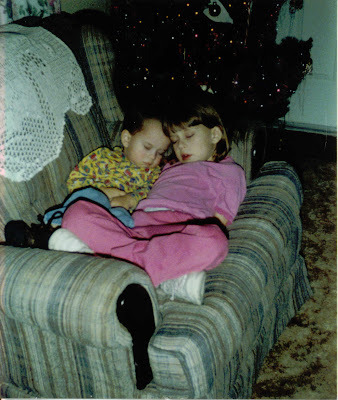 I believe it was taken in early December 1996, the first Christmas season in our current home. My son was nearly three, and my daughter was six years old. They'd been watching a favorite video when they both fell asleep. My daughter is an adult now, works hard at three jobs, and lives on her own. She is making her own adult Christmas memories now. My son is also is a young adult, gainfully employed, and saving up to afford to live on his own soon. I really miss the days when cuddling them could resolve most of their problems, and I look forward to the days when there will someday be little ones--in the form of grandbabies--in my home at Christmas time once again! They were beautiful: large, soft sugar cookies, cut out in Christmas shapes such as bells, snowman, candy canes, and Santas. Well-frosted and covered with colored red or green sprinkles, they begged me to bite into them! Closing my eyes to savor the moment, I sank my teeth into the sweet holiday treat...and nearly gagged. Something was wrong, dreadfully so! The first sense of taste was all I could hope for, but it was overpowered by something...smoky, and sour, and nauseous: cigarette smoke. And not just any kind of cigarette; it must have been the strongest, unfiltered brand out there. They were gifts, those cookies; Christmas gifts from the neighbors, whose last name, ironically, is an adjective for sugar, honey, and cookies (I'm refraining from writing it here; experience has taught me that the last people you'd expect to read your blog, do!). We rarely visited their home, because the interior always was clouded by a heavy pervasive fog of smoke. The cook of the house surely made those delicious-looking cookies while a cigarette hung from her lips. How disappointed I was! The following year, the event was repeated. And, I believe for the five years I lived in that neighborhood, it occurred every holiday season. I always took one hopeful bite. "Maybe this year..." I would silently pray, only to be let down once more. While we occasionally made Christmas cookies at home, we usually didn't make sugar cookies, so to be given them was a treat--a terribly dissatisfying tease, in this case. To this day, I can't look at a sugar cookie without thinking of those neighbors! Then I sink my teeth into a sweet, well-frosted cookie, ever so grateful that I'm not tasting nicotine! Our family did not have a holiday party every year; Christmas was a mainly a family affair. I believe my classroom always had a party (more on that upcoming in Advent Memories No. 16). Occasionally, my parents would invite someone over to share Christmas dinner, but it was not a "party," per se. We lived too far away from family to have regular holiday gatherings, too; in Advent Memories No. 13, I'll tell about a special Christmas with family in Michigan that we enjoyed one year. When I moved away from my parents' home in Northeast Washington to the "big city" of Spokane in the fall of 1984 to attend college, work for my church, and live with my pastor's family, I attended several holiday parties each year. Our youth group of high school and college-age kids had a party, and a girlfriend and I somehow ended up as hostesses. We went out shopping and bought matching dresses. The mall we shopped at was a new big thing in town at that time. Originally, it had been a strip mall, and had only recently been enclosed. Now it sports three stories and is nearly surrounded by multi-level parking garages. At work, we always had a whole-staff party, as well as a department staff party. I worked for The Salvation Army Kindergarten/Pre-school/Day Care, and we ladies would always go out for a nice luncheon. It seems to me we would exchange cards and/or little gifts (maybe we had a name exchange; I don't remember). Then the whole Salvation Army staff would get together as well. Now that I work for the local school district, there are several holiday parties thrown each year, some department, and often a whole-staff, party. The teacher in my classroom likes to treat us assistants to a pedicure and then drinks and hors d'oeuvres. Just like in my day care days, we bring little gifts and enjoy our time away from the students. The whole staff is usually invited to the principal's home, but I haven't attended so far. The name tag is courtesy of Thomas at Destination: Austin Family. This post is a part of the "Advent Calendar of Christmas Memories" meme created in 2007 by Thomas and Jasia. You, too, can write your own Christmas memories, either for your personal journal or blog. Visit Geneabloggers to participate and to read others' posts on these topics. I don't know if Thomas and Jasia knew this when they picked December 6th to be the day to write about Santa Claus, but today is St. Nicholas Day. The Dutch brought the feast of Sinterklaas (St. Nicholas) to America when they settled New Netherlands (modern-day New York state and New Jersey) in the 1600s. St. Nicholas Day was a day of feasting and gift giving for children and sweethearts, and little ones would put out their klompen (wooden shoes) by the hearth filled with hay for the saint's white horse, with hopes that morning would find them refilled with chocolates and little gifts. Naughty children could be expected to find a switch, instead, with a arning that if they were not good, Zwarte Pieter (Black Peter, the good saint's Moor servant) would whisk them away in his large sack, never to be seen or heard from again! 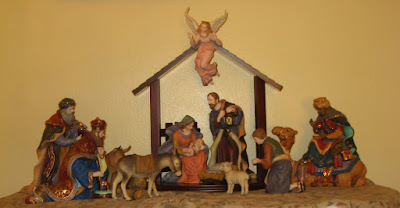 Christmas Day was not celebrated as we know it now, but was a solemn, religious day. Over time, with help from Thomas Nast and whoever really wrote "A Visit of St. Nicholas" (a.k.a. "The Night Before Christmas"), the character of the personality we know as Santa Claus developed and evolved. I don't ever remember sending a letter to Santa Claus. I do know that Santa never flew a sleigh pulled by eight tiny reindeer and one red-nosed one...I know, because I have seen what he really flies in! Since I don't know my aircraft makes and models real well, I'm going to venture to guess that what I've seen Santa arrive in at the city dock of our Southeast Alaskan village was a six-passenger Cessna 180 Skywagon fitted with floats. And he comes from Ketchikan, not the North Pole! Besides, everyone in Alaska knows North Pole is just a village near Fairbanks, and not near the North Pole at all! Like I said, Santa would arrive from Ketchikan in the Cessna, and all of us schoolkids would have our noses glued to the windows on the bay-side of the classroom, watching him come up the hill. Then we would line up in our hats and coats and head for the ANB - ANS hall, about the distance of a block or so from the school (there were no blocks, or paved roads, for that matter, in Klawock at that time). The Alaskan Native Brotherhood and Alaskan Native Sisterhood is a fraternal organization. Non-natives could be invited to join, but could not vote. The organization's hall was used as gym for basketball tournaments, a funeral chapel for the three-day wakes, and community center for events such as school plays or Santa's visits. Class by class, we gathered around Santa as he handed out little toys from his bag and gave us plastic netting stockings filled with nuts and oranges. I remember watching Santa have a little problem with his beard. It seemed to not quite stay in place. Interesting! 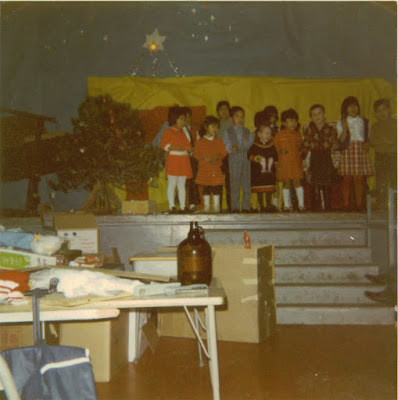 I don't know how many years Santa came to visit the schoolchildren of Klawock, but I do know that in the mid-1970s, my parents starting incorporating St. Nicholas Day as our main day of celebration. Dad ordered us klompen from the wooden shoe factory in Holland, Michigan, and we put those out and on the hearth of the woodstove that heated our home. St. Nicholas always enjoyed the sandwich I made for him, and his horse loved the sweet marsh grass that Dad had cut and cured the summer before. We were always well rewarded with chocolates, Dutch cheese, and gifts--often books about the Netherlands, or in my mom's case, a Delft Christmas plate to add to her collection. I still have the two pair of klompen from my childhood, and my children--even as teenagers--enjoyed placing them under the tree (we don't have a hearth) on the evening of December 5th, waiting to see what St. Nicholas brings. Yes, Virginia, there is a Santa Claus, or St. Nicholas, or Sinterklaas. Whatever you call him, however you celebrate him, he is the Spirit of Giving that lives in all of us, if ever we let him. Considering that the Southeast Alaskan neighborhood I grew up with did not have public electricity, the answers to those questions are "no"! There was a restaurant and lodge to the north of us that had its own generator. Our neighbors to the south that had a sporting goods rental and gift shop also had a small generator they used during the evening. In 1977, we finally got electricity to the neighborhood, but no one had outdoor Christmas lights. In 1979, we moved to a log home up in the mountains of Eastern Washington. While we had electricity, our neighbors were "hid" by the ravines and hills around us. Outdoor lights were limited to a string here and there, from what I can remember. Here in the city, there are quite a few neighborhoods that go "all out," and each year the city transit system has a tour where you can see all the best ones. We have our favorite neighborhoods that we visit during this season, in our family car. Our favorite years are those when there's been just enough snow to cover the lights strung on bushes, so that the colors glow through the snow. In one of these neighborhoods, we often see a covered sleigh pulled by draft horses touring around. One of these times, we'll have to try that! 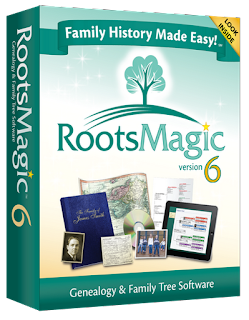 I was very excited to hear my favorite genealogy software RootsMagic announce their latest upgrade, version 6, two weeks ago. It's hard to believe sometimes that this program can get any better, but somehow they manage to come up with new features that are more efficient and user-friendly than ever. Actually, the secret is that the developers of RootsMagic listen to their customers and incorporate requested features whenever feasible. Whenever I'm asked why I prefer RootsMagic to any other, I tend to outline all my favorite components: how RootsMagic had the Pedigree View before anyone else did way back when it was still known as Family Origins; the ability to color-code names or entire branches of a tree (although, I'm still waiting for the color orange to be available, hint, hint! ): RootsMagic-To-Go, your entire working database on a flash drive so you can access all your data at any computer, anywhere (relative's home, work, research library, archival institution); user-friendly intuitive features; and its clutter-free--yet menu-accessible--interface. So what is new and improved in RootsMagic 6? I've taken some time to explore and review these, and I think you'll like them as well. The first item I explored was the editable timeline. While the timeline is not new, I really did not explore it or use it to its full capabilities in earlier versions. 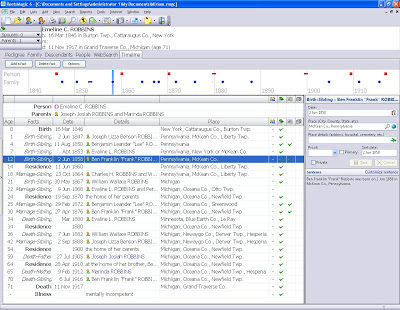 Besides seeing an individual's events in chronological order, one can also choose add to any combination of parent, sibling, child, spouse, or shared events, as well as manipulate the order of the place names, show place details, and show the graphic timeline (with the blue and red bars). What is new is the ability to edit any names, dates, and places that appear on the timeline from this view. For instance, if I noticed that Emeline's brother's name was misspelled, I wouldn't have to close this timeline view of Emeline's, search on her brother's name, and then open his edit menu. I can simply click on Emeline's brother's name here on her timeline, correct the spelling, and voila! The edit is complete. I can then create a WebTag of this image and attach it to my sources, to provide a link for myself and others to easily access the original image. My third favorite component of version 6, although it is not new, is that I can view and edit two database--or even different individuals in the same database--side by side. This comes in really handy when I need to copy information from one individual to another, whether it be simple data, or a source or citation. 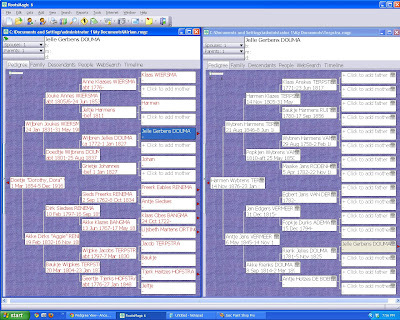 Below is a screenshot of two of my databases. The first is my own, and the second is the database of my significant other. You will notice that we are distantly related (the exact relationship is fifth cousin, twice removed). I have data in my own database from information I have researched in online records. 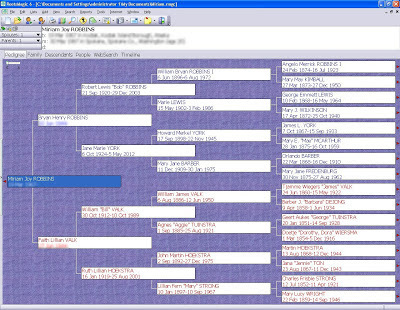 The data in my honey's database comes from a downloaded GEDCOM shared by a cousin of his who has researched the family tree. 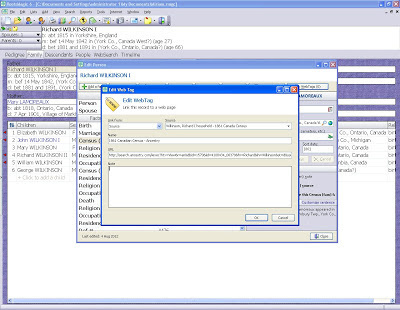 By flipping back and forth, I can add add information to each database without having to merge the two to ensure that both have the same data. Some of the other new features include Find Everywhere, which allows you to search all text--notes, sources, citations, names, places, events--for a word or phrase. CountyCheck Explorer allows you to look up counties and states in the U.S., Canada, United Kingdom, and Australia to view information about them. From this feature, you can also go online to learn more at the FamilySearch Wiki page for counties and states, as well as the interactive state historical county boundaries map at the Newberry Library website. Finally, Publish Online offers a new, dynamic site for your family tree with pedigree, family, and individual views, notes, sources, and media for each person in your database. This replaces the older, HTML "90s look" of the old-style publishing options that were available. While I haven't had a chance to try this out yet, it does look intriguing. If you're looking for a good genealogy program, or are wondering if it's worth upgrading your current RootsMagic program, I highly recommend RootsMagic 6. At $29.95 for a new purchase, or $19.95 for an upgrade, it's affordable and well worth the investment. It can also be purchased with a user's manual for $39.95 at Amazon.com . Customer support is personal and prompt. You don't have to worry that this version will be replaced every year with a new one, making your older version obsolete simply because the calendar changed. Unlike some other genealogy software companies, RootsMagic doesn't pump out a new product on a regular basis simply to make money. They make sure they are meeting their customers' needs and providing a great product, and only when the demand requires it, do they release a new, improved version. I'm looking forward to continuing to utilize this great resource to enhance my research, stay organized and focused, and easily analyze my results. If you'd like to see these features in-depth, I recommend viewing the free webinar "What's New in RootsMagic 6" here (under "Past Webinars"). Disclosure: I was given a copy of RootsMagic 6 to review on this genealogy blog. I was not compensated monetarily, or in any way other than stated, for this review. I have long been a RootsMagic user and strong proponent since my first experience with its earliest product, FamilyOrigins. I am an affiliate for Amazon.com, and as such, receive compensation for products advertised on and linked from this blog. Did your family send them? Did your family display the ones they received? Do you still send Christmas cards? During the last four weeks, I've been going through the letters my mom wrote her parents in Western Michigan from Alaska during the years 1966 - 1978, and have just started 1977. There are many December letters tucked inside Christmas cards during those years, although I don't specifically remember Mom sitting down with a stack of them to sign and mail off. It may be that she purchased just a few to mail to family and friends, or perhaps she was able to buy them by the box. I do know from what she wrote in those letters that it was hard to buy holiday cards of any kind in Southeast Alaska. My mother's greeting to her parents on Easter or Mother's or Father's Day, for instance, usually consisted of the weekly letter with best wishes for the family member(s) and an explanation that no store on the island sold greeting cards. Once we moved to Eastern Washington in 1979, I do remember our family sending off greeting cards. Sometimes Dad would get a neighbor to take a nice group photo of our family with his camera and get some Christmas photo cards printed up. We would dress up for these photos, most of the time. Mom would tuck newsy notes or letters in with both the greeting cards and the photo cards. I think cards were taped along the beams of our house in Alaska, which had a cathedral ceiling, but I'm not sure if I'm remembering that correctly. 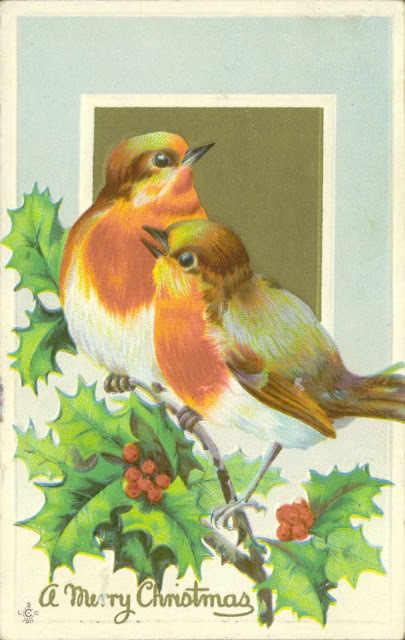 In our home in Eastern Washington, the cards were always--and still are--taped around the doorway and pass-through between the dining area and kitchen. After I married, I started sending out Christmas cards to friends and family members, and after our children were born, I added photos and a Christmas letter. I haven't done a Christmas letter every year, but I did most years. They're fun to go back and read, because I always hit the highlights of the past 12 months. The past few years, with postage so expensive and with most people in my e-mail address book having color printers, I've just e-mailed my Christmas letter and scanned photos of our family, while mailing "hard copies" to family and friends without Internet access. 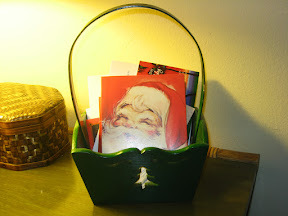 The cards we receive are placed in a green Christmas wooden basket on our coffee table in the living room. After Christmas is over, I go through and save the photos and Christmas letters. Most of the cards, unless unique or extra special, get their covers reused as gift tags for next year's Christmas, or passed on to non-profit organizations that recycle them. Growing up, I don't remember any particular heirloom or cherished ornaments. I do remember stringing popcorn once or twice, and I know we made paper chains and ornaments for our classroom tree at school. Chris was my aunt's oldest child, a cousin just three months younger than me, who died unexpectedly in his sleep in his dorm room at Gonzaga University on December 15, 1985. Naturally, these ornaments are very special, and I always think of Chris when I set up my tree, as well as his younger sister Carrie, who was in the hospital with brain cancer the day of my bridal shower. She passed away shortly afterward on May 14, 1987, just 12 days before my wedding. She was to have been my maid of honor. I had a slide show displaying a few of the beautiful handmade ornaments, but the site no longer works (I'll have to create another one). My aunt has continued to make ornaments over the years, and they've joined the box of originals to make quite a collection. 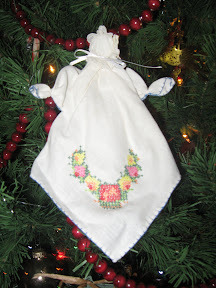 One of my favorites was the doll see below, made from a napkin and tablecloth set that belong to my great-grandmother, Marie (LEWIS) ROBBINS. Marie had purchased the linens from Lillie's Department Store in Coopersville, Michigan and embroidered the corners and edges herself. Aunt Louise had inherited the set, but it had become damaged while in storage. She salvaged the materials and created these cloth doll ornaments, and gave one of each to me, my sister, and our girl cousins. So it is doubly sentimental to me. I also have many ornaments that bring me very happy memories; clever crafty ornaments given by my mother's sister-in-law; still others by students and co-workers, more family members and friends. Some of my favorites are the six from when I worked at my children's elementary school. The principal always decorated the tree in the foyer with a fantastic theme rivaling anything you could see in a magazine. One year it was gingerbread men, another a sports theme, still another everything nautical. Each staff member would have a matching ornament with his or her name on it and the year as a keepsake. Our principal always started the new theme with his wife's school's tree (she was also an elementary school principal); then the following year, our school would get the decorations. The next two years, the decorations would go to two other schools; so everything was recycled and enjoyed by many students, staff and families around the district. (Again, I'll need to make a new slideshow of those ornaments). Olie bollen literally means "oily balls" or "fat balls" and they are what we know as donut holes. I buy these, both plain and with powdered sugar, almost every year for my family at my local supermarket and often bring them to class on St. Nicholas Day, while I tell my students about our Dutch traditions. For Christmas dinner, Mom would always make a big traditional meal, usually with whatever meat we had raised on our farm. We had a variety of poultry to choose from: chicken, duck, or goose. We also had rabbit, ham, or chevon (goat meat). Along with the main meat dish, there would be mashed potatoes and gravy, home-grown cooked vegetables, cranberry jelly, and pickles and black olives. Dad's favorite dessert was mince-meat pie, and I think one year, we had homemade mince-meat after we had butchered a hog. I also remember homemade apple pie with slices of cheese. When we have Christmas at my house, I don't usually go all out with a large, sit-down dinner. My kitchen is pretty small, and it's hard to crowd a dozen people around my dining room table, even with all the leaves out, so I'll often have a buffet instead. Depending on the time when we open gifts, sometimes it will be a brunch with crackers, meats, cheeses, and the like. At other times, I'll have plates of sub sandwiches with side dishes. Always, we have several desserts to choose from. When we go over to my brother-in-law's place, we'll sometimes have a traditional meal, especially if it's Christmas Eve. If we meet between Christmas and New Year's, we often have a comfortable dinner of homemade stew, rolls, and a salad, followed by dessert. My brother-in-law is a pretty good cook, and usually makes the stew. In the past, New Year's Eve was normally spent at home. All evening, we would graze on any leftover goodies that may have survived Christmas Day. Sparkling cider was bought for the kids when they were young, and my drink of choice to see in the New Year used to be rum and Coke. Lately, I prefer a glass of wine or champagne. Did you have a real tree or was it artificial? How big was the tree? Who decorated the tree? I lived in the woods of Southeast Alaska and Northeast Washington for most of my childhood... yet we had an artificial tree for most of those years! We must have had real trees when I was very little, but I never remember decorating them or seeing them set up. I do have vague memories of seeing a tree in our living room in Kake, Alaska and again in our mobile home in Klawock, Alaska; they would have been real. Sometime in the mid-1970s after my parents built their house about a mile outside of Klawock, they got a small artificial tree and decorated it with red and white velveteen-covered doves, roses and ribbons. Since we did not have electricity out on this farm, we did not have lights on the tree. It was a family joke that we lived in one of the largest forests in the nation, yet we had an artificial Christmas tree. It did make sense because most of the trees around our home were very tall, and it was wasteful to cut down small trees for Christmas that could have instead grown up to be good for lumber, firewood, or shade. I think we kids always helped decorate the tree. The first year I were married (1987), I had a real Charlie Brown Christmas tree. My former husband worked for The Salvation Army Family Services department, and a bunch of Christmas trees had been donated to give to needy families. He brought the last one home on Christmas Eve after the department had closed for the holiday. That tree was so bad, no needy family had even wanted it! It stood about three feet tall, and there was no bad side to place against the wall...every side was the bad side! I only had a handful of decorations, but I did the best I could to fix it up! It had kind of been an impromptu thing, as my former husband really wasn't into celebrating Christmas at that time, and only brought it home after I had protested, "We have to have a tree!" Over the years, I have had a couple of artificial trees that served their purpose well. This year I am planning to decorate the tree in a different way as a tribute to my ancestors and love of genealogy. Stay tuned! "The Salem M. E. Church.--This church, located on a picturesque rural spot at the junction of the roads leading from Thompson's Mills to Schapsville, and from Apple River to Elizabeth, on section 23, was erected in 1869. It was the first built in the township, Christopher Columbus Thompson and William Witham being the active men to whose zeal, exertions and influence the Methodists are indebted for its erection, George Westaby donating the land (one acres) on which it stands. It is a commodious frame building, 23 by 44 feet; cost $1,600, and is clear of debt. It was dedicated by Rev. S. A. W. Jewett. Rev. 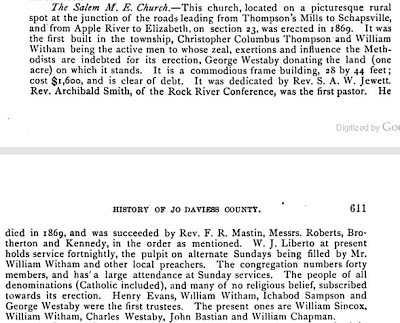 Archibald Smith, of the Rock River Conference was the first pastor. He died in 1869, and was succeeded by Rev. F. R. Mastin, Messrs. Roberts, Brotherton and Kennedy, in the order as mention. W. J. Liberto at present holds service fortnightly, the pulpit on alternate Sundays being filled by Mr. William Witham and other local preachers. The congregation numbers forty members, and has a large attendance at Sunday services. The people of all denomination (Catholic included), and many of no religious belief, subscribed towards its erection. Henry Evans, William Witham, Ichabod Sampson and George Westaby were the first trustees. The present ones are William Sincox, William Witham, Charles Westaby, John Bastian and William Chapman." "Westaby C. farm; Sec. 25; P. O. Houghton. "WESTABY GEORGE, Farmer; Sec. 23; P. O. Houghton; son of Thomas and Mary Westaby, of Barron [sic - Barrow-upon-Humber], Lincolnshire, Eng., where he was born Nov. 19, 1822; was married April 12, 1850, to Miss Ann, daughter of Wm. 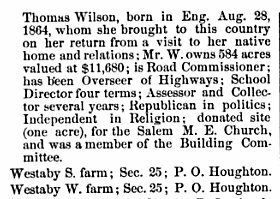 and Maria Wilson, of Alton LeMoor [sic - Holton le Moor], Lincolnshire, and emigrated to this Co. same year; she was born Oct. 22, 1822; they have four children: Stephen, born June 12, 1852; Tom, March 12, 1855; Wilson, July 17, 1857, and George Rice, March 29, 1863; they lost by death two daughters and one son; they are raising a grand-nephew of Mrs. Westaby, Thomas Wilson, born in Eng. Aug. 28, 1864, whom she brought to this country on her return from a visit to her native home and relations; Mr. W. owns 584 acres valued at $11,680; is Road Commissioner; has been Overseer of Highways; School Director four terms; Assessor and Collector several years; Republican in politics; Independent in Religion; donated site (one acre), for the Salem M.E. Church, and was a member of the Building Committee. "Westaby S. farm; Sec. 25; P. O. Houghton. "Westaby W. farm; Sec. 25; P. O. Houghton." George Rice WESTABY, I was my children's paternal 4th-great-grandfather. There is mention of his parents, Thomas WESTABY and Mary SPAULDING, wife, Ann WILSON, and their son, George Rice, Jr. (who went by "Rice"), and parents-in-law William WILSON and Maria [--?--], all of whom are also direct ancestors of my children. "Independent in Religion" doesn't mean non-denominational or non-religious. 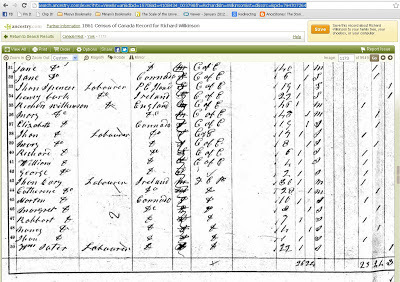 In older English census records, the Independents were listed with the Congregationalists. They have similar roots as the Separatists (known in America as the Pilgrims of Plymouth Colony), and the Puritans of Massachusetts Bay Colony. Charles WESTABY, mentioned in the paragraph about the Salem Methodist-Espicopal Church, as well as the first entry of Westabys ("C. Westaby") in the biographical listings for Thompson Township, was George's brother, who emigrated with him in 1850. 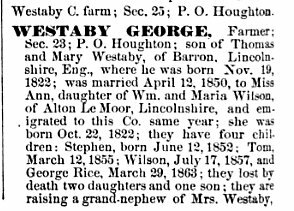 The "S. Westaby" and "W. Westaby" listed after George were likely his nephews, either Spencer or Spaulding, and William, as they are farming in the same section as Charles. However, it is possible they could instead have been his sons, Stephen and Wilson. This information was taken from The History of Jo Daviess County, Illinois, containing A History of the County, Its Cities, Towns, Etc. : A Biographical Directory of Its Citizens, War Record of Its Volunteers in the Late Rebellion, General and Local Statistics, Portraits of Early Settlers and Prominent Men, History of the Northwest, History of Illinois, Map of Jo Daviess County, Constitution of the United States, Miscellaneous Matter, Etc., published in Chicago by H. F. Kett & Co., 1878. The paragraph regarding the Salem M.E. Church is found on pages 610 and 611, whereas the biographical sketches are found on pages 794 and 795. This county history, along with many others, can be found at the Internet Archive and Google Books.